By definition, something you do for pleasure that then makes you feel guilty afterwards. Hmmm. Don’t have a lot of those. There’s the usual, eating puddings. Minty chocolate fridge cake, sticky toffee pudding, banoffee pie, or – if none of those are available – large bars of Fruit and Nut chocolate. I suppose I usually feel fairly guilty the morning after polishing off the second bottle of wine but that’s generally associated with a massive hangover. Does that still count? Look at the movies in the middle there. Sky Captain and the World of Tomorrow. The Mummy (and The Mummy Returns). League of Extraordinary Gentlemen. The Frighteners. 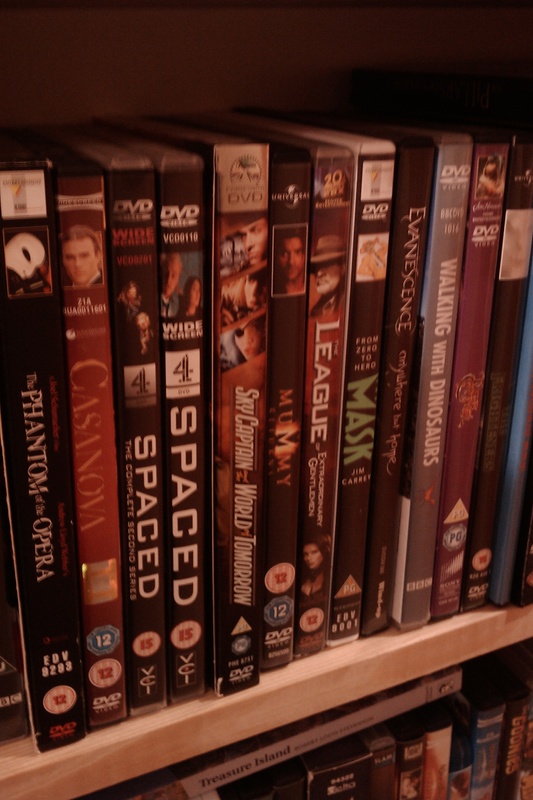 Elsewhere in my collection there’s Hudson Hawk, Push, Cloverfield and others of a similar ilk. I really shouldn’t like movies like these. They’re B-movies at best, but I love them! There’s something fantastic about these movies, something I can’t explain or defend. I’m almost alone in my house in loving these films – I fear I may have already infected my daughter as LXG has been in the DVD player a few times of late. Ah, well. There’s 4 other kids who may escape – or not. Now. Before you head over to The Gallery proper and see what everyone else has as their Guilty Pleasures, I’ll leave you with a song! I’m afraid you’ve lost me, totally. I have never heard of any of these films but I bet if I ask my SIL she’ll know exactly what you’re talking about. No way! I used to watch Hudson Hawk as a kid. In fact I still remember that song. I love Bruce Willis. It’s a Bromance. I have that one, and Side by Side, on the iPod. Classic songs, classic movie. Hudson Hawk is an amazing film. Name a better pair of bad guys than Sandra Bernhard and Richard E. Grant. This was my favourite film for years and I kept singing that song over and over. Good to see the Dark Crystal in your collect as well – another splendid movie. I say bravo to your collection! Those 2 really hammed it up there. I loved the MTV-IA team as well. Yep, got the Dark Crystal. Labyrinth is there somewhere as well. Previous PostPrevious #Listography – What makes my house my home?